Sarnath is the place where Lod Buddha gave his first sermon after attaining enlightenment. Buddha delivered his first sermon to five monks here, they are Kaundinya, Vappa, Bhadriya, Mahanaman and Asvajit for redeeming humanity. 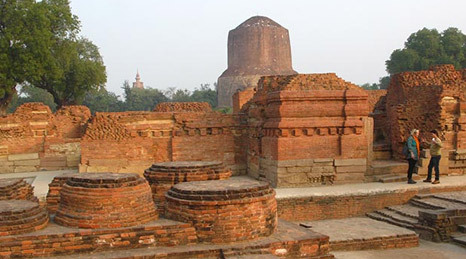 In Sarnath only foundation of new order of monks and new order of religious doctrine or Dhamma was laid out. The four important places associated with Lord Budha are Lumbini where Buddha was born, Bodhgaya where he attained enlightenment, Sarnath the place he gave is sermon and Kushinagar the place of Mahaparinirvana or heavenly abode. 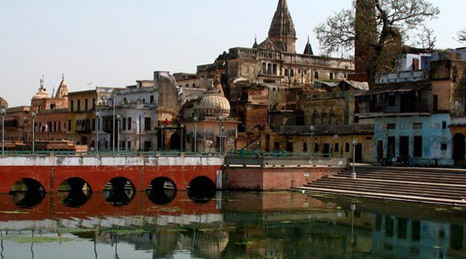 Ayodhyain the state of Uttar Pradesh is situated on the right bank of the river Saryu. Ayodhya is a popular pilgrim centre for Hindus. It is about 225 kms or 5 hrs. drive from the city of Varanasi. According to ancient textbooks Ayodhyais one of the seven most sacred cities of India. The important place of interest are Ramkot, the site of the ancient citadel of Ramkot, Kanak Bhawan where images of Sri Rama and Sita wearing gold crowns, The Hanuman Garhi which is constructed in the shape of a fort, Mani Parbat and Sugriv Parbat, the stupa built by the Emperor Ashoka, Nageshwarnath Temple,Saryu River, one of the most prominent waterways in Uttar Pradesh and holy river by Hindus. Besides this Gurudwaras at BrahmKund and Nazarbagh localities have been associated with Guru Nanak Dev Ji, Guru Teg Bahadur Ji and Guru Govind Singh Ji. TulsiSmarakBhawan, the temple dedicated to the great saint and poet Goswami Tulsidas is also worth to visit. 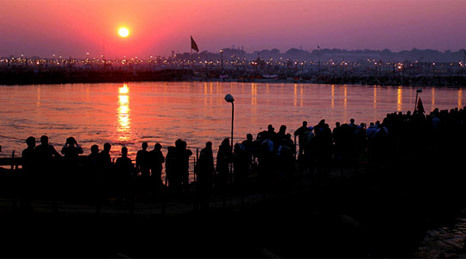 Allahabad is the place where the holy rivers Ganges, Yamuna and Saraswati meets. Thousands of devotees visit this place every year and take bath in the meeting point of the holy rivers. Allahabad is one of the most favoured tourist destinations in India, having a several tourist spots to explore. A lot of prominent personalities like Harsha, Akbar, Dara Shikoh, Hiuen Tsang, Fa Hien, Khusro and Queen Victoria visited the city of Allahabad. 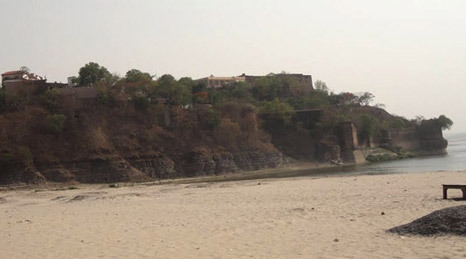 Main tourist attractions are Sangam where the three rivers meets. During Kumbh Mela this place is filled with thousands of pilgrims. The Allahabad Fort, built by Akbar in AD 1583, depictions of design, architecture, art and craftsmanship of the fort. Visitors are allowed to view the Ashoka Pillar, Saraswati Kup and Jodhabai Palace here. The underground temple of Patalpuri Temple and Akshaya Vat located inside the Allahabad Fort is also a place to visit. Anand Bhawan , the ancestral home of the Nehrus, Swaraj Bhawan, built by Pt. Moti Lal Nehru, Hanuman Mandir, Allahabad Museum etc are also places of interest. Kushinagar, is a town and a Nagar Panchayat in the Kushinagar area of the Indian condition of Uttar Pradesh situated around NH-28, and is 52 km east of Gorakhpur city. It is an imperative Buddhist journey site, where Buddhists trust Gautama Buddha accomplished Parinirvana after his demise. Outside India, it is an International Buddhist Pilgrimage Center. The supporters of Buddhism, particularly from Asian nations, wish to visit this spot in any event once in their lifetime. The leaning back Nirvana statue of the Buddha is inside the Parinirvana Stupa. Statue is 6.10 meters in length and is made of stone monument red - sand stone. It speaks to the "Withering Buddha" leaning back on his right agree with his face towards the west. It is put on an extensive block platform with stone-posts at the corners. 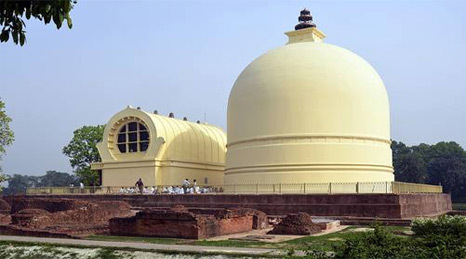 Kushinagar is arranged at a separation of 53 km west of Gorakhpur, in Uttar Pradesh, in northern piece of India. Chunar is situated 42 kms away from Varanasi in the Vindhya ranges. The District headquarter Mirzapur is a very famous for its Historical events, natural beauty, Handicrafts & other Industrial setups and from the religious aspects as well. The fort of Chunar was established by the King of Ujjain,Maharaja Vikrmaditya to commemorate the stay of his brother Raja Bhartihari. It is believed that he had taken his Samadhi in alive stage and still that Samadhi Sthal is worshiped. Within the fort King Sahadeo built a stone umbrella based on 52 pillars in the memory of the victory on 52 other kings, which is still preserved. His brave daughter got married with Alha the then King of Mahoba whose marriage place in still preserved with the name of Sonya Mandap. As per AlhaKhand in 1029 AD. King Sahadeo made this fort as his capital and established the statue of Naina Yogini in a cave of Vindhya hill and put the name as Nainagarh. 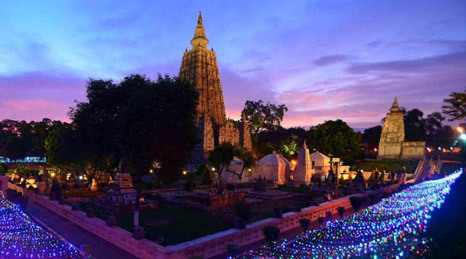 For Buddhist believers Bodhgaya is one of the most sacred places in the world. Under the Bodhi tree (a large banyan tree), where Gautama attained enlightened.Gautama Buddha was prince of the King of Kapilvastu (now in Nepal), he later became enlightened and thousands became his followers. Several centuries after Buddha's passing away, the Maurya Emperor Ashoka (234-198 BC) contributed tremendously towards the revival, consolidation and spread of the original religion. Buddhism as a religion was really born in Bihar and evolved here through his preaching and the example of his lifestyle of great simplicity, renunciation and empathy for everything living.